All pliers are handmade from quality tool steel and are specifically designed for chainmaille. These pliers come in light duty, medium duty or heavy duty. What makes these pliers different from most commercial ones is the shorter jaws, which give you more control and better leverage. As for the jaw shapes, they can be custom made to almost any shape, as can the contour of the handles. Left: Heavy duty angled box jaw pliers. 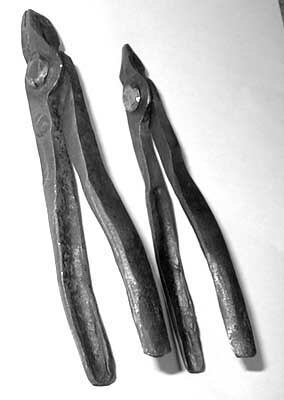 Right: Light duty angled needle nose pliers. light, medium or heavy: $18ea, $35/set. medium or light: $16ea, $30/set. Your choice of jaw shape, texture, and handle shape is included in price. Trading for these is also an acceptable form of payment. Items are not stocked, so please allow some time for them to be made and shipped (i'm on summer break so that shouldnt be too long). Buyer pays shipping unless otherwise agreed upon. There is a 10 day unconditional money back return policy (less shipping). To order or inquire email thexnihil@aol.com. L6: this is a low alloy tool steel with .90% of carbon and trace amounts of vanadium and moly. in industry it is used for large saw blades. it is designed to withstand shocks while still holding an edge. 1095: this is a simple carbon steel with .95% carbon in it. overall this metal can be made slightly harder than L6, but will not absorb shocks as well. in terms of being used as pliers, however, it performs very well. 5160: this is a low chrome alloy steel with .6% carbon. in industry this is used as car springs (hence why this is cheaper to use-i get it virtually free). it does not harden as much as 1095 or L6, however this metal makes great pliers that take abuse. 1040: a simple carbon steel with .4% carbon. again, another recycled material (made from bolts). this steel is a bit softer than the 5160, but it'll take that much more abuse. 304SS: a non hardening alloy of stainless steel. i only recomend pliers from this if you really think you need them to be stainless steel. 52100: this is a medium chrome alloy steel with 1% carbon. in industry it is called 'ball bearing steel'. if you need a pair of pliers with maximum hardness, i suggest this metal, however, it does tend to be brittle, even in a normalized state, therefore, this alloy will not take abuse. 1018: otherwise known as 'mild steel', containing .18% carbon. this metal would be useful if you wanted maximum durability, however, that also comes with maximum softness as well. for a happy medium i suggest 5160. 01: an oil hardening steel with 1% carbon. this is a fairly hard and durable steel, however it does tend to be a bit pricy. S7: a vanadium shock steel with about 1% carbon. often used in 'high heat environments'. a bit pricy and hard to work, but doable.